"The finest slice of noir in twenty years. 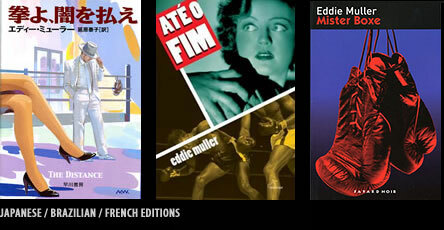 It combines the very essence of the classic noir movies and a riveting narrative . . . plus, a love story to tear your heart asunder." "Pungent, poignant, wonderfully atmospheric  an absolute knockout of a first novel." "A rare treat, at once a throwback to crime novels of days gone by and at the same time something very fresh and new." Eddie expounds on being an "overnight success"
Check out what else UglyTown is publishing. Originally published in hardcover by Scribner, January 2002. Contains an Introduction by Leonard Gardner, an Author Commentary, and a collection of never-before-published deleted scenes from early drafts of the manuscript. 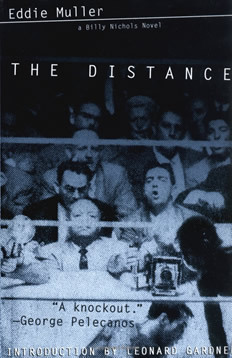 The Distance was one of the most highly acclaimed fiction debuts of 2002, winning both the Shamus Award (from the Private Eye Writers of America) and the Gumshoe Award (from Mystery Ink) as "Best First Novel." It was also nominated for the Anthony, Barry, and Macavity awards in the same category. The demimonde of professional boxing resounds with echoes of classic film noir in this thrilling debut novel from an author renowned in both fields. It's 1948, an era when newspapermen were starsand San Francisco sportswriter Billy Nichols is no exception. Known as "Mr. Boxing" throughout the city, he is the West Coast's answer to Damon Runyonan insider's insider who plucks and polishes his pearllike stories from the nonstop hustle of the city's nightclubs, gambling dens, and ringside seats. Billy Nichols is right where he wants to be, until he stumbles onto a shocking crime scene. Heavyweight boxer Hack Escalante has killed his manager, and for reasons Billy doesn't fully understand, he makes a spur-of-the-moment decision to protect the prizefighter. Soon Billy's in too deep, caught in a conspiracy of desire, deceit, and betrayal, and he sets off a chain of events whose consequences may cost him his beloved careerand his life. As Billy himself struggles to escape suspicion, he must square off against relentless police detective Francis O'Connor, carry on business as usual with his colorful cronies in the boxing world, and resist his overwhelming passion for a woman he dare not love. Billy soon discovers that he's not the only yarn spinner in this nefarious netherworld: many of the characters inhabiting his well-honed newspaper columns have crafted their own alternative life stories, hiding scores of secrets. Whose story will emerge as "truth"? SAYS EDDIE "If I walk in front of a bus tomorrow, at least I’ll have written this. It’s the one that matters most out of all the work so far."